This one comes to us from the "never say never" category of perfume picks. I think I've mentioned before that I'm having a gentle rose moment this year, which is surprising even to me. I've made two such purchases, Etat Libre d'Orange Eau de Protection (Rossy de Palma), and Linen Rose from the Aerin line by Aerin Lauder. I'm also this close to picking up a bottle of Grace by Comme des Garcons. Maybe. Even more surprising to me than liking the rose theme of this Aerin perfume is that I even tried it on considering the "linen" part. Linen perfumes often mean laundry musk (with the exception of Estee Lauder's White Linen, a nose-scorching aldehyde overload. No judgment. I've gone through a bottle twenty five years ago). The name gives an impression of a watery, scrubbed down modern beachy-marine kind of thing, with the added suspicion of it being an eau de cologne in a honking 6.7 oz bottle that you're supposed to spray and spray and spray until you get enough to last you through the next couple of hours. I had two samples languishing on my dresser which at some point found themselves being actually tested. I probably was looking for a reason to dismiss the Aerin brand once and for all (I've never enjoyed anything from them). Instead, I smelled coconut. And a white romantic rose, salty bleached driftwood on a windswept untamed beach, bare feet on gray damp sand, a long and sheer long dress billowing in the salty stinging air, and a promise of warmth and coconut in days to come on said beach. It's been resonating with me for the last couple of months of this longest, endless winter. An additional charming facet of Linen Rose is that while it hints of summer, the general fee is not June roses in all their lushness but of petals standing up against steely gray skies and a week-long drizzle. A cottage garden in coastal English village that dreams of lazy summer days but takes comfort in the vanillic woody dry-down and fantasies of coconut shells on a faraway beach. This season couldn't have asked for a better olfactory representation. a couple of words regarding the eau de cologne concentration, wear time and sillage. Linen Rose needs to be lavishly sprayed on body and clothes (see billowing dresses and chiffon scarves). I do the exact opposite of spraying in the air and walking through it. No way. I spray myself again and again as I walk along my bedroom until I'm satisfied. It's a lot and it's still fairly moderate. I get about six hours of wear, a little more if I'm giving it my all (or rather the bottle is giving me it all). Sillage is still within acceptable social norms, especially since the perfume doesn't project from here to eternity. It's perfumy, for sure, but still sheer and modern enough to be an easy choice on most days. Just take into account that the more you spritz the prominent the coconut note becomes. I'm perfectly happy with that. Aerin- Linen Rose ($170, 6. oz) is available from large department stores that carry the Aerin line as well as online (Bloomingdale's, Nordstrom, etc.). I bought a bottle after receiving samples as GWPs. 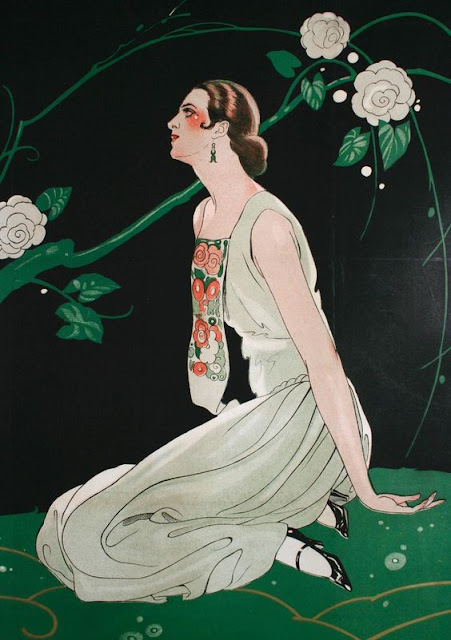 Art by Umberto Brunelleschi, 1924. I put all my Aerin scent samples in the bag to be sold or given away. Reading this, I need to go through that bag and see if there's a sample of Linen Rose and pull it out to try.